Born Jul 28 18881,2,4,6,7,8,9,10,11 [Jul - 188712], Asheboro, Randolph County, North Carolina1,2,4,6,7,8,9,10,11. Hinshaw, James, head-of-household, age 41, born in North Carolina; parents born in North Carolina; first married at age 21; rented home ($22 rent); no radio in home; occupation: carpenter, builder; not a war veteran. Hinshaw, Sadie, wife, age 41, born in North Carolina; parents born in North Carolina; first married at age 21. Hinshaw, Willard G, son, age 18, born in North Carolina; parents born in North Carolina; occupation: laborer, furniture factory. Hinshaw, Margaret F, daughter, age 11, born in North Carolina; parents born in North Carolina; attended school. Hinshaw, M. Eadeth, daughter, age 9, born in North Carolina; parents born in North Carolina; attended school. Hinshaw, James E, head-of-household, age 51, born in North Carolina; completed 6th grade; on Apr 1 1935 was living in the same place/city; rented home ($22/month rent); occupation: carpenter, building construction; worked 40 weeks in 1939; $1000 wages in 1939. Hinshaw, Sadey W, wife, age 52, born in North Carolina; completed 6th grade; on Apr 1 1935 was living in the same place/city. Hinshaw, Willard, son, age 28, born in North Carolina; completed 7th grade; on Apr 1 1935 was living in the same place/city; occupation: spring [..unclear..], furniture factory; worked 44 weeks in 1939; $660 wages in 1939. Hinshaw, Massie M, daughter-in-law, age 31, born in Tennessee; completed 8th grade; on Apr 1 1935 was living in the same place/city; occupation: seamstress, overall [..unclear..]; worked 30 weeks in 1939; $360 wages in 1939. Hinshaw, Margaret, daughter, age 21, born in North Carolina; completed 3 years of high school; on Apr 1 1935 was living in the same place/city; occupation: wi[..unclear..], silk mill; worked 44 weeks in 1939; $792 wages in 1939. Hinshaw, Mary E, daughter, age 19, born in North Carolina; completed 4 years of high school; on Apr 1 1935 was living in the same place/city; occupation: redr[..unclear..], silk mill; worked 44 weeks in 1939; $700 wages in 1939. Jim's obituary was published in the "High Point Enterprise" (High Point, North Carolina) on Monday, May 26, 196914 (see scan below). 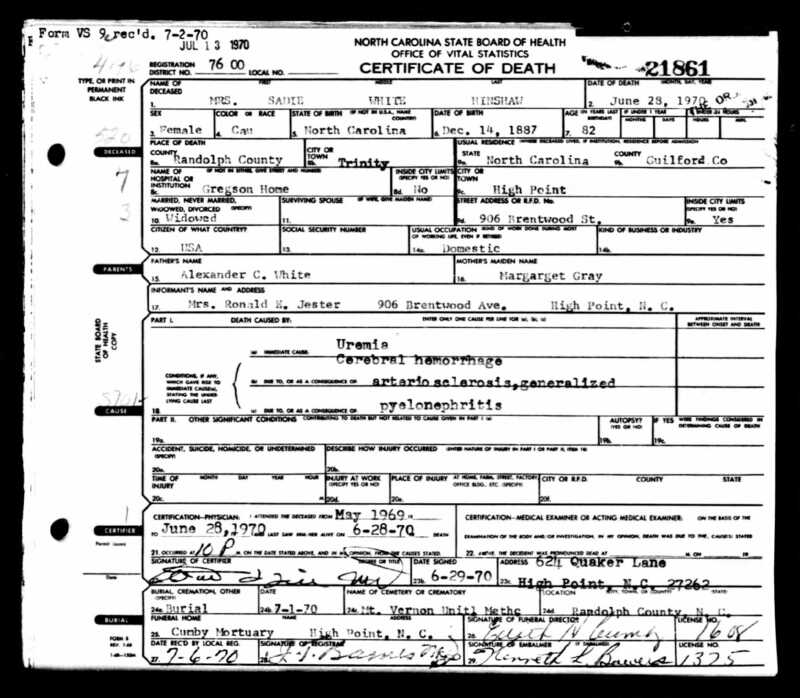 Sarah died Jun 28 197010 [Jun 30 197011], Gregson Home, Trinity, Randolph County, North Carolina10; age 8210. 1930 census, High Point, Guilford County, North Carolina; roll T626-1695, ED 59, page 15A, line #39, dwelling #278, family #292. 1940 census, High Point, Guilford County, North Carolina; roll T627-2921, ED 41-92, page 19B, line #71, household #355. 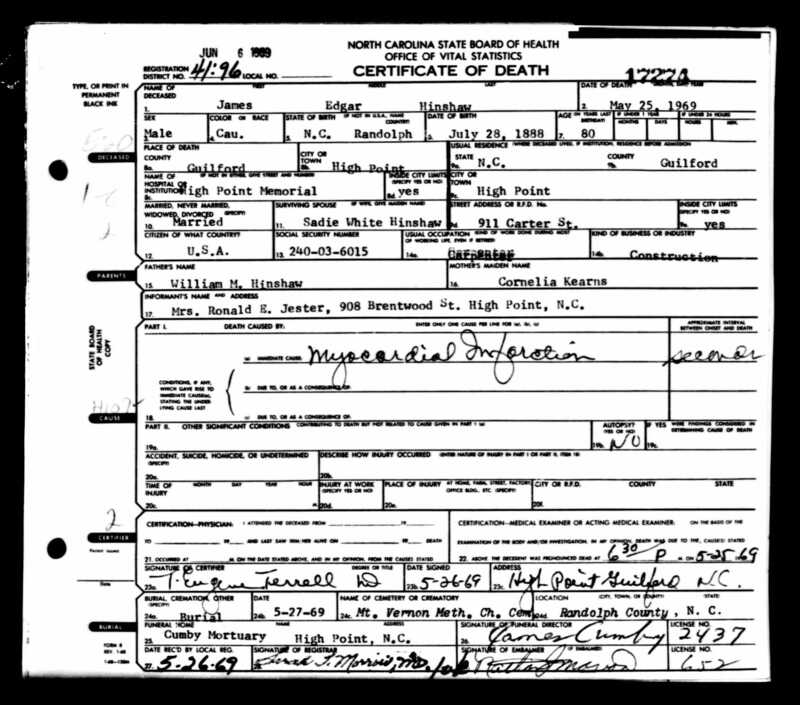 Willard Gray Hinshaw death certificate. RootsWeb WorldConnect data by Crystal Dawn Eaton Cooper (). 1900 census, Back Creek Township, Randolph County, North Carolina; roll T623-1212, ED 80, page 3B-4A, line #99, dwelling #54, family #54. Obituary of James Edgar Hinshaw; "High Point Enterprise", May 26 1969; http://www.ancestry.com. 1910 census, Trinity Township, Randolph County, North Carolina; roll T624-1128, ED 99, page 4B, line #77, dwelling #63, family #63. Death Records, 1968-1969. Orem, UT: Ancestry, Inc., 1998.